A new friend of mine got me interested in comic books again, after a many year hiatus. I started borrowing these collections from the local libraries, which actually have a pretty good selection, although it is spread out across all of them. I got the idea from Lindsay from a podcast called Comic Book Queers. They are a lot of fun. I just finished these two books, which are the first two trade volumes of Astonishing X-Men. Very entertaining, I couldn't put them down until I was done! Chad and I worked pretty much all day cleaning our house and running errands and such. We also put up these reading lights that we got at Ikea many months ago. We were hoping to put up a shelf that we've had for probably over a year but didn't get around to it. The lights are attached to our bed so they can shine right in our laps - perfect for reading! I'm actually using mine right now and it's great! We still have so much more to do though to get our house ready for Andy's visit next weekend! While in the KoP area yesterday we stopped by Ikea (of course, how can you NOT when you're that close??) and I bought myself this small Billy bookcase. Chad already had one and I was jealous because he can keep more stuff in the bedroom that way. So I put mine together today. We're doing a bit of cleaning so this helped me clean up my area of the room. But you can see how little space there is between my bedside table and the bookcase right? There's a lot more space on Chad's side but that's because the dressers are there too and we need to be able to get into them. My bookcase also blocks part of the window but oh well. I need it!! This is my post for yesterday. Chad and I went out to the King of Prussia area and we passed this strange Dunkin Donuts. The colors of the building were totally different than the normal DD colors. And look at the sign on it. It is in the normal orange and pink but the building is red and dark brown/black. Totally clashes. Very bizarre. For dinner tonight we had green beans. Yup, green beans. That's it. Actually, it was more of a green bean - yellow wax bean mixture. These are beans from our CSA. I used a Madhur Jaffrey recipe to cook them - mustard seeds, garlic, salt, sugar, pepper, and red chili. It's pretty darn good and quite easy to make! Tonight I think I added a little too much salt. This is what I came home to today. The roof is pretty much done. There was such a mess everywhere! It appears that they pretty much did all the work first and cleaned up afterward. It would have been nice if they had made an effort as they went, but right now they just left (9:15PM) and it looks pretty clean out there. Of course, it's dark so I can't really tell. I hope everything is okay! At least the color is a whole lot nicer than it was before and there is flashing where it meets the house which is a huge improvement. 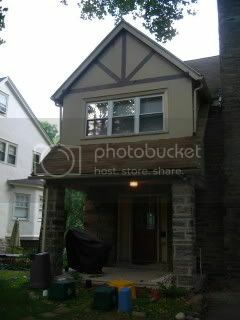 I'm going to post a photo here of what it used to look like yesterday. There is a 24 hour difference between these two photos. Pretty amazing, huh? You're probably wondering why there are trash cans and recycling bins scattered all over our front yard. No it is not an installation of modern "art". The reason is that we finally having our roof done tomorrow! Hopefully it will take 2 days to finish. The purpose of all these containers is to protect our favoritest plants, especially our Witch Hazel and most of our ferns. We're hoping they can work around all the cans so that everything will stay protected. We also hope that nothing happens to any of Deb and Bud's plants! That would not be good ... Anyway, wish us luck. I'll be sure to post photos of the roof progress if I can get any good ones. I just finished it. 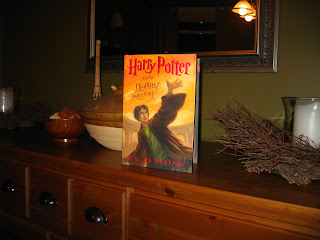 The final Harry Potter book. Don't worry, I won't spoil the story for anyone. I have been frantically trying to complete all 759 pages because I thought I might accidentally overhear or read somewhere what happens in the end of the book. So I've been avoiding TV, radio, and the internet as much as possible for the past two days. I finished it just about 1 minute before it had been 48 hours after being officially released into the world. I would have finished it much earlier today except that Chad and I went to see the new Harry Potter movie at the IMAX theater in King of Prussia. I can't believe it's over. As Adina says in her post from today, at least we have the next two movies to look forward to! Especially this one! And here is my book! This was taken when we got home at about 1 AM today. I didn't post because I was READING! And that's what I'm going to do now too! Oh, we also went to a concert tonight. We went to see Jay Brannan at L'Etage, the place above the Creperie Beau Monde. He's pretty awesome and the venue was pretty cool too. This is my post for yesterday, the 20th. Chad and I went to Barnes and Noble at about 10:30 pm to wait in line for Harry Potter! 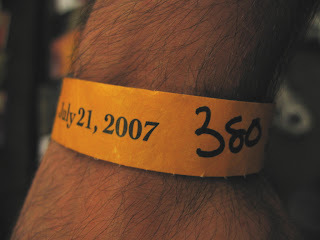 As you can see here, I had a gold wristband because I had preordered the book. I was number 380 in line!! Craziness. They let us buy 2 books even though I only reserved one and the crazy thing was that they never even checked my name to see if I had actually preordered. So we got home a little after 1 AM and I started reading and read until almost 4AM. Yippee! It was pouring rain while I drove home today. Fun. At least it didn't last long, although I was kind of hoping it would because we really need the rain for the yard/garden. So yesterday you got to hear about us going to see Eric Himan and now you get to see our loot! 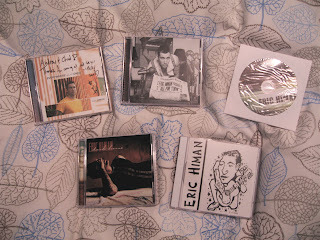 Eric sold us these 5 CDs at a nice discount. I felt kind of bad because he's an independent artist and everything. The songs are great. We are missing 2 of his CDs. I can't believe he has put out 7 CDs! Well, one of these is an EP (only about 5 songs) and one of his is a live show. But still, that's a lot of discs! Chad and I went to World Cafe Live to see a singer named Eric Himan tonight. We had dinner and coffee and dessert and watched the show. It was absolutely amazing and I recommend him to everyone. You can click HERE to go to his myspace page where you can listen to some of his music. If you're in the Philly area, he's planning to be back in the fall so feel free to join us! 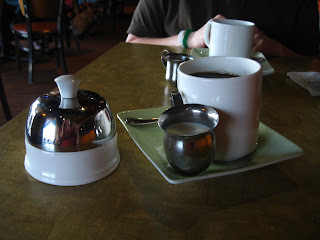 I liked the way they served the coffee. It was a little unnerving though. The saucer the cup sat on didn't have a flat bottom so it just rested on the 4 sides. Pretty cool. Anyway, we had a good night but now we're beat. So we had a weekend of ice cream this weekend. Last night was ice cream at Erin and Matt's and tonight we enjoyed some ice cream with Deb and Bud. I spent about 4 hours or so outside trying to make the yard look nice (lawn mowing, sucking up leaves, pulling weeds, etc.) and then after grocery shopping and dinner we went over to their house to have ice cream from The Creamery at Penn State. They were there at the end of last week for the arts festival and brought back the ice cream with dry ice all the way (about 5 hours in the car). They must really love it! It was good ice cream. The Coffee Break was tasty and the vanilla went really well in our Virgil's root beer float. Today we went to Erin and Matt's house for cake and ice cream to celebrate Erin's birthday. Matt asked us to pick up a cake he had ordered from Genuardi's and also some ice cream so we did. But we couldn't decide what ice cream flavors to get. I really wanted to try their chocolate peanut butter cup but wasn't sure how many people were going to like that. So then I thought that we should get mint chocolate chip because Erin always used to like that. But again, I wasn't sure how many people would want that, so we decided to get just plain vanilla and chocolate. So, we ended up buying 4 containers of ice cream. We also forgot to ask how many people were showing up so didn't know how much we would need. There were 8 people there. So, we had 2 gallons of ice cream for 8 people. Needless to say, there was quite a bit left over! But guess which flavors were the most popular? Mint chocolate chip and chocolate peanut butter cup!! Pretty funny. I decided to clean out my car a bit today. One of my coworkers asked if I could take him home tomorrow and Monday because it's somewhat on my way and I agreed. I would hate to bring someone in my car and have it be filthy. So I dusted off the dashboard and vacuumed the floor and seats and took out all the trash. Hopefully it is presentable enough. Meet Chad's and my favorite veggie burgers! These are portobella and garlic burgers made by Veggie Patch and they are outstanding. We eat them with pepperjack flavored veggie slices (vegan cheese), ketchup, and mustard. Today we didn't use buns or bread because we didn't have any. They are soooo good, I recommend them to anyone, not just vegetarians! We got them because they were on sale at Genuardi's. Plus, Chad has decided he wants to stop eating terrestrial based meat (I don't think he has had any since maybe Thursday of last week - fish doesn't count) so I am trying to join him to make it easier for us to eat meals together and because I think it's a good idea too. We'll see how it goes. My problem is that about 95% of my favorite foods are made with chicken or beef. My friend Yuki is so thoughtful! We arrived home to find a package from her among our mail. It turned out to be some soba and sauces. They all look really good. What a nice surprise! This is one of the pigs of the Pigs on Parade in Seattle. Chad and I went around taking pictures of as many as we could find without going too far out of our way. I think we managed to find 27 out of 94 or something like that. You can see all the photos on my flickr page. This is my post for Monday. We spent the majority of the day traveling so I couldn't post until today. Chad didn't want to go up in the Space Needle while in Seattle, which was fine with me because I've been before. but today we visited the Experience Music Project and the Science Fiction Museum which are located right next to the needle. Here is a photo of the International Fountain and the Space Needle in the background. This is a pretty crazy area of Seattle that was built pretty much just for the World's Fair. It's like a constant carnival down there. 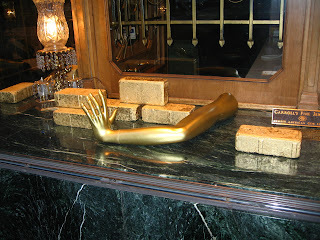 Does this golden arm make you want to buy jewlery? That's what the owners of this jewelery store are counting on! Isn't this just such a bizarre window display? I mean, the gold bars don't even look like gold! They could have at least made them look smooth like all the gold bars I've ever seen! Haha. Crazy Seattle. This is my photo from yesterday. We spent the evening/night with Seina and Phthisis. It was so much fun. We took the Underground Tour which was pretty cool. Our first night in Seattle we got a dinner recommendation at Bob, the guy at the hotel's front desk. We ended up walking about 30 or 35 minutes away to go to an Ethiopian restaurant. Chad and I both got the vegetarian combo and so they brought our food out on one plate. We ate using bread as the utensil. It was delicious but we were soooo stuffed afterwards! We went to the American Camp on the southeastern tip of the island today. We walked along South Beach for about an hour trying to reach the lighthouse pictured here. We got to a point where we decided we just couldn't get there from the beach, so we headed back. Then we drove over and tried to get to the lighthouse but there was no obvious way. So then we walked down on the beach from the other direction and finally found our way up. It was lucky that it wasn't very hot out or else we would have been dieing! It was a fun day of walking around at the beach. We also saw one whale swimming along off in the distance. Today we visited Roche Harbor on San Juan Island. It is about 10 miles from Friday Harbor, and, interestingly enough, the entire town/harbor is privately owned. It is actually a resort but it seems like more of a town. It was quite a cute place and it was THE place to be for 4th of July. They had contests and all kinds of events. There were hundreds of decorated boats in the marina. But one thing I really wanted to do was to check out this Mausoleum (click the link for more info) that I had read about on a postcard. Sorry I'm not posting a photo of Independence Day festivities, but I just thought this was so much more interesting. Do you see Chad poking his head out? Here is a photo I took today of the tower at the top of Mount Constitution on Orcas Island. It's a wonderful view from here. You can apparently see Canada in the distance although it doesn't look any different than the U.S. Imagine that. Haha. We spent pretty much the entire day on Orcas and it was quite lovely. It got to be pretty hot in the sun in the mid afternoon, but other than that it was great weather all day. 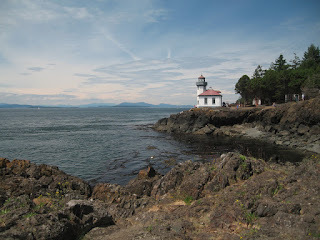 This is the Lime Kiln Lighthouse at Whale Watch Park on San Juan Island. We walked around there today but didn't see any whales. Apparently the current was flowing against them, so it was going to take a while for it to get there (some people are really obsessed and track all the whales' movements). We had a pretty full day of visiting the Lavender Farm, the Alpaca Farm, the English Camp, and this. We had some lunch from a little shop in town and walked around a bit. We're supposed to make salmon for dinner but none of us really feels up to it. I guess we'll see. Maybe we'll just have ice cream instead. Check my flickr page for more photos. It will take me a while to upload all of the good ones because the connection is pretty slow here out on the dock. Today we spent the majority of the day traveling again. I woke up at about 6 AM because I wasn't tired anymore. It was 9 AM our time, after all. We got up and got ready and then had a lovely breakfast at the hotel. We had cheesy hash browns with salsa which was delicious. After that we walked over to Pike Place Market to show Chad around for a bit. We got some lovely dried fruits, some mini-donuts from Daily Dozen, took our photo in front of the first Starbucks and just wandered around the streets. We're looking forward to spending more time there when we're back in Seattle next weekend. Then we left Seattle at about 11 AM to drive to Anacortes to grab the ferry to Friday Harbor. The ferry didn't actually leave until about 3:45 PM and we got to Friday Harbor at about 1/4 to 5. We met Kathleen Nelson (a teacher at ASIJ in Tokyo that my mom was friends with) and had some gin and tonics and snacks with her. We walked around Friday Harbor and bit and grabbed some food. This photo was taken down by the ferry dock in Anacortes. I am most likely going to post a bunch more photos to flickr at some point so I'll let you all know when I do that. We only get internet out on the deck, and it's pretty cold so I may not be out here every night. Having a great time so far!